Rest In Peace Fr Maxim Furtado (74) and Fr John D'Souza (73), both of whom were living at Vianney Home for Retired Priests when they died in an accident. Fr Joseph Martis, rector of St Joseph Seminary, Jeppu, who was driving the jeep, sustained minor injuries and admitted to hospital. He is recuperating. It was explained that they were going to Kulur church to take part in mass on the occasion of the birthday of parish priest Fr Harold D'Souza, when a speeding bullet tanker hit their vehicle from behind near Kottara Chowki. 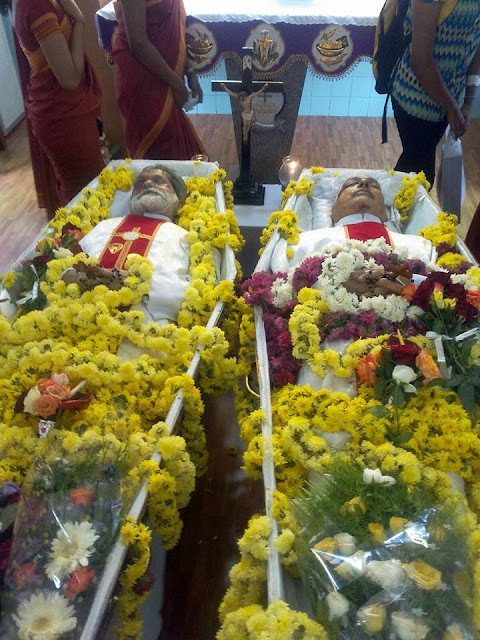 They were rushed to different hospitals, where Fr Maxim and Fr John were declared dead. Fr Maxim E Furtado, from Madanthyar, was born on November 19, 1941. He served at Thottam, Kota, Byndoor, Olavinahalli and other parishes. He retired from his service a year back and started staying at Vianney Home from last year. Fr John D'Souza, from Kinnigoli, was born on April 22, 1942. He served at Urwa, Angelore and Siddakatte and worked as professor at Jeppu seminary. He retired two years back and came to Vianney Home for his post-retirement life. During his tenure new church building at Urwa was built. Incidentally, both the deceased priests were ordained on the same day, that is, September 27, 1967. Dr Aloysius Paul D'Souza the bishop of Mangaluru visited the hospital after the tragic news came. MLA J R Lobo, priests and lots of people also visited the hospital.